Routledge is pleased to offer NCA members 20% off all books and free global shipping. Enter discount code NCA19 at checkout to receive your discount. The Twitter Presidency explores the rhetorical style of President Donald J. Trump, attending to both his general manner of speaking as well as to his preferred modality. Trump’s manner, the authors argue, reflects an aesthetics of white rage, and it is rooted in authoritarianism, narcissism, and demagoguery. 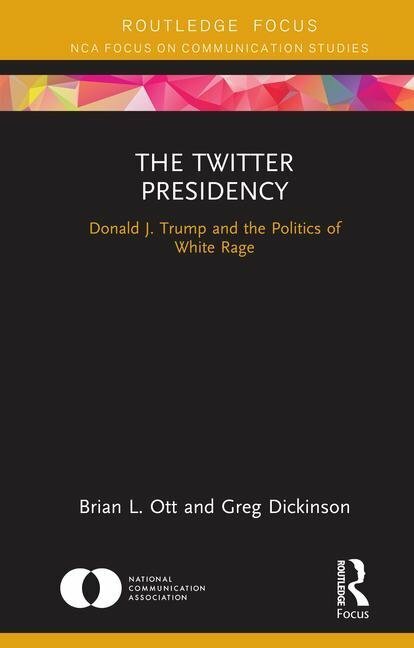 His preferred modality of speaking, namely through Twitter, effectively channels and transmits the affective dimensions of white rage by taking advantage of the platform’s defining characteristics, which include simplicity, impulsivity, and incivility. There is, then, a structural homology between Trump’s general communication practices and the specific platform (Twitter) he uses to communicate with his base. This commonality between communication practices and communication platform (manner and modality) struck a powerful emotive chord with his followers, who feel aggrieved at the decentering of white masculinity. In addition to charting the defining characteristics of Trump’s discourse, The Twitter Presidency exposes how Trump’s rhetorical style threatens democratic norms, principles, and institutions. If you have an idea for a potential future volume for the Organizational Frontiers Series, please contact series editor **************.